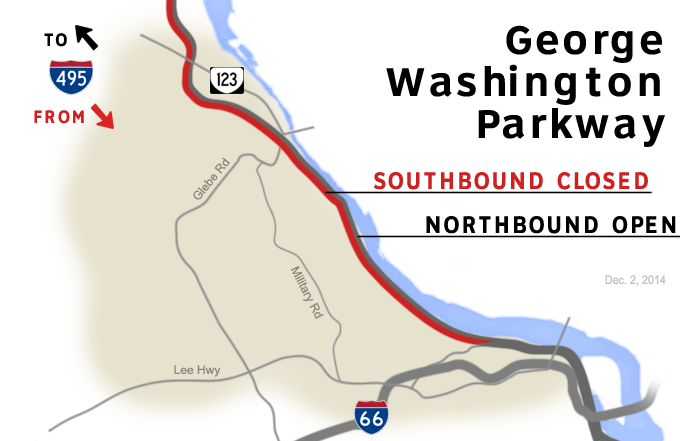 A sinkhole has closed the southbound lanes of the George Washington Parkway between the Capital Beltway and Spout Run Parkway. 123 and Spout Run Parkway at Windy Run due to the sinkhole. Earlier, Park Police said all lanes reopened overnight. It is not yet known how long the one-lane closure will last. Washington Parkway is open, and the right is predicted to be open by morning. during both the morning and afternoon commutes. a.m., the highway administration said in a 3:30 p.m. update. Both the Inner and Outer loop ramps to the parkway also remain closed. can enter the parkway at Spout Run. triggered a four-car wreck as vehicles tried to avoid the deep hole. The Park Service says the hole is about 10 feet wide by 5 feet in length. temperatures must be 45 degrees or warmer to pave with asphalt. the delays and head back north. now warn drivers that the ramps to the parkway are closed. I-495 to Exit 50 Rt. 50 (Arlington Boulevard) towards D.C.
WTOP’s Jim Battagliese contributed to this report. Follow @WTOP and @WTOPTraffic on Twitter and WTOP on Facebook.